The time has finally come! It was my turn to choose this week's recipe for Tuesdays with Dorie and let me tell you, for someone who has a hard time taking decisions, this was not an easy task. Baking from my Home to Yours is full of fantastic recipes, and every time I thought I had the one, I flipped a page and found another! But I kept coming back to the cake that got Dorie fired, Chocolate Armagnac Cake. I love the story that goes along with the recipe about how Dorie got bored of making the same desserts every day, decided to change things up a bit and came up with this cake. Granted, she got fired for it, but I admire her for trying something different. I mean, come on, there are so many dessert recipes and variations in Baking from my Home to Yours, I can't imagine Dorie making the same dessert over and over again. And that's only one of her books! So, anyways, I chose the cake because I liked the story, and I was lucky finding the ingredients. Out shopping one afternoon, I came upon a shelf full of Scharffen Berger chocolates, for a fraction of their usual price! There was milk chocolate, semi-sweet, dark and... bittersweet. Bingo! Then I found the moistest, fattest prunes ever, just like that, I wasn't even looking for them. And, I would get to flambé again, which is a plus. It was decided right then and there, I was making this cake, and so were all the other members of Tuesdays with Dorie who wanted to try it. I knew a lot of people would be put off by the prunes but I also knew that a lot of people would try it anyways and find out that prunes aren't so bad when they're mixed in with a little booze, loads of chocolate, butter and sugar! I'm glad I didn't fiddle with this cake, it's perfect as is. I might just try the original version next time though, you know, just to change things up a bit. Thanks to all of you Tuesdays with Dorie members who baked along with me this week, I hope you had fun and discovered something new that you liked. And thank you Dorie, for daring to be different and inspiring us to try out new recipes every week. Getting ready: Center a rack in the oven and preheat the oven to 375 degrees F. Butter an 8-inch springform pan, fit the bottom of the pan with a round of parchment or wax paper and butter the paper. Dust the inside of the pan with flour and tap out the excess. Put the pan on a baking sheet lined with parchment or a silicone mat. To make the cake: Whisk together the nuts, flour and salt. Combine the chocolate, butter and the remaining 3 tablespoons water in a heatproof bowl, set it over a pan of simmering water and stir occasionally until the chocolate and butter are melted; or do this in a microwave oven. Remove the chocolate from the heat just as soon as it is melted and not very hot—you don’t want the chocolate and butter to separate. In a large bowl, whisk the egg yolks and sugar together until thick and pale, about 2 minutes. 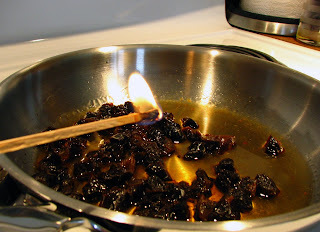 Switch to a rubber spatula and, one by one, stir in the chocolate and butter mixture, the nut mixture, and the prunes with any liquid. Working with a stand mixer fitted with the whisk attachment or with a hand mixer in a large bowl, beat the egg whites until they hold firm, glossy peaks. Stir about one quarter of the beaten whites into the chocolate mixture, then gently fold in the remaining whites. Turn the batter into the pan. Bake the cake for 28 to 32 minutes, or until it is puffed, firm on top and starting to come ever so slightly away from the sides of the pan; a thin knife inserted into the center will come out streaky—the cake should not be wet, but you don’t want it to be completely dry. Transfer the cake to a rack and let it cool for about 10 minutes, then carefully remove the sides of the pan. Invert the cake, pull off the paper and turn right side up to cool to room temperature. The cake should be absolutely cool before you glaze it. Getting ready to glaze: If the cake has crowned, use a long serrated knife and a gentle sawing motion to even the top. Turn the cake over onto a cooling rack—you want the very flat bottom of the cake to be the top. Put a piece of wax paper or foil under the cooling rack to serve as a drip catcher. 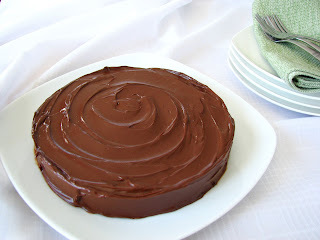 To make the glaze: Melt the chocolate in a heatproof bowl over a pan of gently simmering water, or in a microwave oven. Remove it from the heat and, using a small spatula, stir in the sugar, then the butter, a bit at a time, stirring until you have a smooth glaze. Have a long metal icing spatula at hand. Pour the glaze over the top of the cake, allowing the excess to rundown the sides, and use the spatula to smooth the top of the cake if necessary—usually the glaze is a self-spreader—and to even it around the sides of the cake. Let the glaze set at room temperature or, if you want to speed it up, slide the cake into the refrigerator for about 20 minutes. If you’d like the glaze to be more like a frosting, let it cool until it is thick enough to spread, then swirl it over the cake. Serving: The cake should be served at room temperature—chill it, and you’ll diminish its flavor and compact its texture. That said, there are lots of people who like the cake cold, because then it becomes more fudgy. Cream, whipped or ice, is a welcome accompaniment. 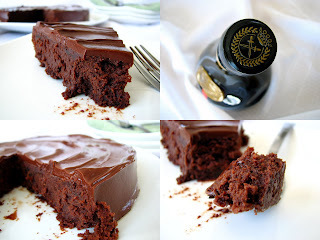 Chocolate Whiskey Cake: The original cake by Simone Beck featured raisins and Scotch, rather than prunes and Armagnac. If you’d like to use that combination, put 1/4 cup raisins and 1/4 cup Scotch whisky in a covered jar and shake the jar a few times. Let the raisins steep for at least 3 hours (or for up to 1 day), turning the jar upside down and then right side up from time to time. When you add the raisins to the batter, add whatever whisky remains as well. Excellent choice - and although I left out the prunes and nuts, it was still an unbelievable cake. One that I would definitely make again. Absolutely fabulous choice. I've been keen on this one since the beginning. I've been wanting to try this, it looks so amazing! This was a really wonderful choice! I just loved it. Yours looks perfect. Thanks so much. I think this is my favourite one so far! Thanks for a great selection, Lyb! Great choice!! I loved it and yours looks absolutely perfect! Thanks for choosing this recipe , we love it !!! Thanks for choosing this Lyb - it was absolutely devine! I also loved this cake, who wouldn't? Pictures tell a real story too. Thanks. This was a great choice, and I love how wonderfully easy it was to make it gluten-free for my boyfriend with celiac's. Thanks for picking it! Excellent choice, Lyb! You did an exceptional job on your cake! It's beautiful!!!! That cake is absolutely GORGEOUS! I love your frosting job!!! It was definitely an interesting cake and you made a fantastic pick! It was a fabulous choice! I'm so glad I decided to bake it, because I loved it! I love how you swirled your icing. Mine is so plain. But I really loved this cake - it was a great pick!!! I will definitely make it again. Thank you for your excellent choice!!!! Great pick this week! I'm so jealous now seeing all these wonderful cakes. I have to make this when I have the time. Your pictures look so pretty! Merci LyB, d'avoir choisie cette recette pour nous cette semaine! Un très bon choix, malgré le fait que beaucoup venaient tout juste de faire d'autres gâteau au chocolat du même genre, pour les Daring Bakers... mais tu pouvais pas savoir. Le principal, c'est que celui de Dorie ait été et de loin, le meilleur de tous! Le tien à l'air sublime, la glace super soyeuse! bravo! Thank you for choosing this recipe. It was well received around my house and turned out truly delectable. Fantastic choice - we loved it, even without the frosting! Thanks for picking this, and making me try prunes. Great choice! It really got me out of my comfort zone - so I am glad to have played along! Great, great, GREAT pick, Lyb!!! This is now in my top three favorite TWD recipes to date. I stuck as close to the recipe as I could (I couldn't find armagnac) and could not believe how fabulous this cake was. It will become a go-to recipe when I need a delicious, impressive dessert. Your cake looks gorgeous. Thank you for the awesome pick! A bold choice! It looks really delish - your pictures are very good and your cake looks fantastic. I did not bake along this week, but will certainly try this cake at some point (especially with such great reviews!). You know how much I loooove this cake! Wonderful choice! Your glaze swirl is beautiful. And you're right, this cake did make me appreciate prunes. I hadn't eaten them...ever?, but they were delicious in this cake. Great pick this week! I didn't use prunes, but only because I was too lazy to go to the store and buy some! Next time though! Thanks for your pick this week! Your cake looks delicious. I love how beautifully you swirled the frosting! i loved it so much! and i'm so glad you made that choice too! Good call. I've wanted to make this cake ever since I got Baking. I, too, love the story that goes with it. Now I just need a reason to make it. This was a fantastic choice! :) I loved it! Thanks for choosing this, it was fun and delicious. Thank you for selecting this recipe. It was great! So good. Yum Yum Yum! I love the classy brownie description! Lovely cake and lovely choice! Thanks! that frosting looks like satin! Very yummy! Thanks for choosing this recipe! We loved it! NIce cake, Im sorry I did not get to make it this time. thanks for a great choice, we loved it. your cake looks perfect! This looks great. I love your pics of the process. This is one recipe I have yet to make from the book. Your cake looks totally fabulous! Your cake is beautiful - I love the icing pics! I like the story, too. Lyb -- you're cake looks great and I'm as happy as could be that you liked it. And thrilled that you used prunes and encouraged others to use them. I think they're an underated fruit and that they're fabulous to bake with, especially, as you pointed out, when you add chocolate and butter and booze. Your cake looks fantastic! Thanks for making a great choice this week! I was unable to make the cake this weekend, but after reading your post and others' comments, I'm sorry I missed out. Your pictures are lovely and you have motivated me to try the cake. Thanks for your pick. Great job, it looks delicious. Haven't seen anyone who didn't like it, since I skipped this one, I'll definitely have to try it sometime! Sorry I slacked on your week but honestly I would have baked just about anything pour vous but me don't do prunes. haha. Although your cake pictures makes me regret I didn't sub with raspberries or something. Your swirl is perfect! Thanks for hosting! Great post! Thanks for letting us bake with prunes!! Beautiful looking cake - love your photographs, you really capture the dense, rich flavor! And I love your frosting technique! Thanks for choosing this great cake! Nicely done! Thank you so much for choosing this recipe- I loved it so much! 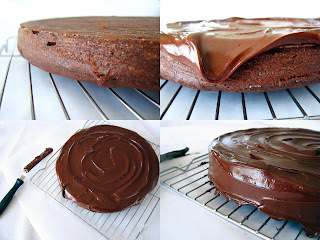 It is my new favorite chocolate cake, I can't wait to make it again! I love that this cake features prunes because they need some good press and this cake is just about the best PR prunes could ask for! So good. Your cake is beautiful! Fabulous choice! I need to make it again soon....I am sure it would make my parents swoon! Ton choix de recette, tes photos et ton gâteau; tout est absolument superbe! Bravo, bravo, bravo!!!!! Your photos are beautiful! Obviously made with love. I have a powerful hankering for a hunk of this cake. Great choice! This is one I probably would have skipped...if it weren't for TWD and I'm not disappointed! Thanks again! What a great choice! I loved it and it's now one of my favorite TWD recipes! A great pick this week. This was one of the first recipes that I bookmarked, and my only regret is not making this sooner. Wow, the prunes really add something special to this cake. Armagnac whipped cream --- sounds heavenly! Great choice. Yours look just perfect. We devoured this cake (whereas some of the desserts we've enjoyed once but haven't finished the batch). It was delicious, so thanks for a great pick! Wow, wow, wow! I need to pick up some dark chocolate ASAP! This is so classy and the photos are top notch! Did you find the chocolate at the dollar store? :) I know they had quite a supply. The cake looks so wonderfully chocolatey and rich and delicious. I think you made a perfect choice! Yay! Good to see you chose this one on your turn, it looks soooooo good! Thanks for choosing such a great cake!!!! 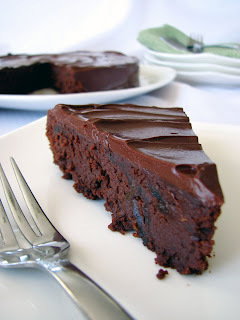 I was soooo glad someone finally picked this - it's in my top five chocolate desserts for sure. Fabulous pick, and beautiful cake! How can you do this to me first thing in the morning. Ahyayaya...I'm drooling! This disappeared so fast around here...my husband and sons were eating it straight off the cake plate...LOL! My first one, well...a little mishap and it fell apart but they did not CARE, they ate every bit of it and wanted another...fortunately they are all thin! Too many rounds of this cake, and I am not so sure it would remain so! Your cake looks so amazing...I love the swirling on the top. I'm nmot a great baker ... but looking at this makes me want to change my ways. Okay, it took me forever, but I finally got this made. What an awesome cake! I love it. I used prunes, scotch, and pecans. I love the underlying fruitiness that the prunes contribute. Thanks for picking this one!! I didn't get the chance to make this cake but after looking at yours, I have to make it at least once! It looks absolutely delicious! Great choice and wonderful photos! I made this recipe recently and have linked your recipe to my blog for those who would like to make it. I hope you do not mind. Thanks a lot ... it's excellent cake - beautiful, fragrant, rich. We liked her very much!